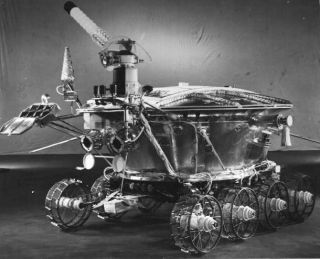 Lunokhod 1 was the first successful rover to explore another world. It arrived on the moon on Nov. 17, 1970, upon the Luna 17 lander. Driven by remote-control operators in the Soviet Union, it travelled more than 10 kilometers (6 miles) in just 10 months. By comparison, it took the Mars Opportunity rover about six years to reach the same milestone. In the 1960s, the United States and the Soviet Union were engaged in a "space race" to send humans to the moon first, in part as a way of showing technological prowess to the world. This resulted in a series of space-related firsts on both sides, such as the first human in space (Soviet Union), first two- and three-person ships in space (Soviet Union), first docking in space (United States) and the ultimate arrival of the first crew on the moon in 1969 (United States). The Soviet Union had pinned its hopes of a manned moon landing on the Zond rocket. However, following a series of test failures, including a deadly launch pad explosion in 1968, the Soviet Union focused on other moon programs instead. Among them was robotically landing a probe on the moon, and operating a rover remotely. Soviet successes at the moon included Luna 3 (which took the first pictures of its far side in 1959), Luna 9 (which made the first soft landing on the moon in 1966, three years before Apollo 11's human landing) and Luna 16 (which returned samples from the moon in 1970). The next in the series, Luna 17, carried a rover for remote operations. The Soviet Union's remote-controlled Lunokhod 2 moon rover traveled 23 miles (37 kilometers) across the lunar surface in 1973 — still the record for greatest distance traveled on the surface of another world. Luna 17 launched successfully on Nov. 10, 1970, and made it to lunar orbit five days later. It soft-landed in the Sea of Rains, and Lunokhod 1, the rover it carried onboard, descended a ramp to the lunar surface. "Lunokhod 1 was a lunar vehicle formed of a tub-like compartment with a large convex lid on eight independently powered wheels," NASA wrote in a summary of the mission. "Lunokhod was equipped with a cone-shaped antenna, a highly directional helical antenna, four television cameras, and special extendable devices to impact the lunar soil for soil density and mechanical property tests." The rover was solar-powered by day and relied on thermal energy from a polonium-210 radioisotope heater to survive the nighttime cold, when temperatures reached minus 150 degrees Celsius (minus 238 Fahrenheit). Because the moon always has one side facing the Earth, this means that daylight on most spots on the surface lasts about two weeks. Night is also two weeks long. The rover was designed to last three lunar days. It exceeded its operational projection, lasting for eleven lunar days; operations ceased on Oct. 4, 1971, which was exactly 14 years after the Soviet Union's first satellite, Sputnik, reached Earth orbit. By the time the mission ended, Lunokhod 1 travelled roughly 10.54 kilometers (6.5 miles), sending back 20,000 TV pictures and 200 TV panoramas, according to NASA. The rover also did more than 500 lunar soil tests. Lunokhod 1 in its final parking spot. NASA's Lunar Reconnaissance Orbiter (LRO) obtained images of the landing site in 2010. The success of Lunokhod 1 was repeated with Lunokhod 2 in 1973, which eventually drove approximately 37 kilometers (22.9 miles) on the lunar surface. It would take the Opportunity rover more than a decade to reach that same milestone on Mars. The rover's retroreflector registered an especially striking "bounce" in 2010 when scientists tried to send a laser signal to it, showing that it hadn't degraded from lunar dust or the elements. Lasers have been used to measure the exact distance from the Earth to the moon, principally using lasers from the Apollo missions. After Lunokhod 2, no other mission soft-landed on the surface until the Chinese space program sent Chang'e 3 and its rover, Yutu. The pair landed in December 2013. While Yutu could not move after its second lunar night, the rover remained alive far past its operational lifetime before stopping 31 months into the mission – far surpassing the previous record.